DBAPixels has started Training Programs to provide a new dimension to corporate technical training pattern. Our Focus area is to provide pre-designed or customized corporate technical training programs in Oracle DBA and Oracle RAC DBA areas. The Creation of DBAPIXELS Training Programs is a result of an ambition to build smart DBA’s via providing value education, marathon lab exercises, Workshops, Case Studies, best practices, Innovative solutions, real life scenarios, Troubleshooting guidelines, effectively impart DBA knowledge to participants via sound and proven database administrations practices and specially repeatable and predictable practices in their daily work and simulated real-time DBA project allocation during training. Real-time DBA project allocation [simulated production IT service environment] including support projects. 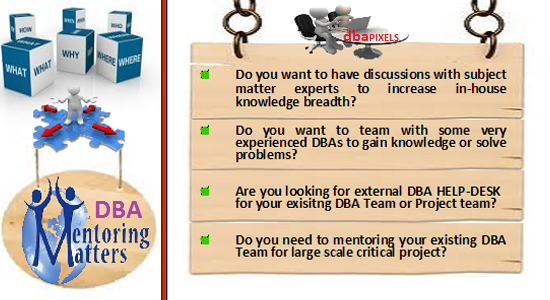 I have designed DBA projects (Extracted from my experience) specially for facilitating corporate training participants. Because I feel this is the best way to groom participants with the real-time project environment, its base build, its issues, escalations, SLA processes, knowledge transition process, maintenance processes, implementation processes, Troubleshooting, application team support, client interaction, email ethics etc. It will cover all major oracle releases like 9i, 10g, 11g to latest releases during technical discussions with the understanding as how and by which enhancements/New Features these releases built over its prior release. Performance tuning and monitoring section is powered by performance engineering toolkit build by me especially for such training programs. We simply call it as “What to Monitor”, How to gather data, Analyze data, Recommend solutions, get it approved, test it in SAND Environment, Implement it in Production and have a healthy production database environment. Performance Tuning is a science and it is a continuous process. You will gain deep understanding of database internals and structures. We design training program, which are interactive and flexible to accommodate constant updates. We share our experiences, which gathered while working in support projects in last 15 years. Taking advantage of this program, corporate can now concentrate on their key business deliveries while we take the responsibility for building their DBA TEAM skills as per project requirements. It is industry-focused training program. Helps employees streamline and accelerate the automated or non-automated processes involved in everyday work. On-line assistance for technical queries post training program, for a period of one month. We welcome you for Enquiry and Detailed Updates on corporate Training programs.